Want to make the ultimate Thanksgiving turkey? That’s bursting with flavor and juicy as all get out? Follow our instructions below. 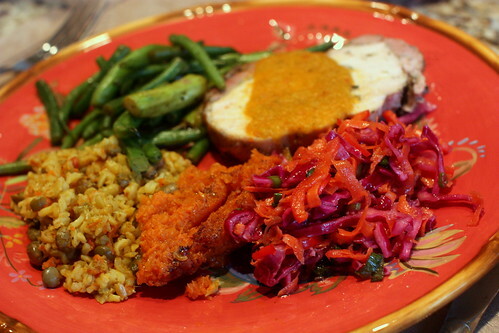 This is by far the most colorful Thanksgiving plate I’ve ever seen. So after visiting Guavate, Rachel and I knew that we had to try making Pavochon ourselves, the real Puerto Rican way. This year, it happened that Thanksgiving was only going to be 4 of us — Rachel’s parents and the two of us, so we were assigned to doing the cooking. So if we were in charge, why not mix it up and do it Puerto Rican style? The last time we visited Turkey Burgers here on OTB, it was nearly a year ago. And while I think the rules of bold seasoning still apply — I’ve personally gone from turkey burger as occasional curiosity to turkey burger as virtual necessity. Turkey burgers and ground turkey meat in general has become a staple in our household now that we have gone down the healthy lifestyle route. And why shouldn’t it? It’s a very malleable protein, which is great at absorbing flavors, be it used in a burger, sausage, kebab, chili or even stir-fry dishes. And it shouldn’t surprise you that in future cooking posts, you’re going to see this ingredient creep up a lot. This last weekend we got particularly burger crazy, as we wanted something easy to cook because we were all burned out travelling to Connecticut and bringing back our new dog, Kona, from the folks at Flora’s Pet Project. And it didn’t help at all that we were all couch potatoed when we got back and watched dietician-chef Ellie Krieger on Food Network cook up some particularly tasty looking DIY Diner Food. Our first Turkey Burger was a bit of a cheat, as it involved the use of pre-made frozen burgers from COSTCO. All hail the mighty Kirkland! 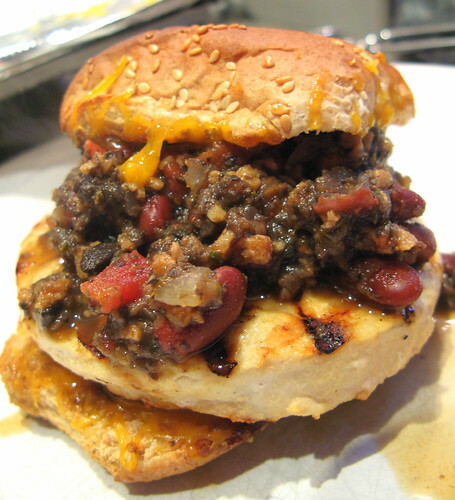 But we amped up this burger with our Giant Mushroom Chili that we made for the Superbowl along with a small amount of melted cheddar cheese, served on a whole grain burger bun. But it was a quick and easy lunch, and really satisfied that Chili Burger craving. Hell, the last time I had a real chili burger was back in August at The Varsity in Atlanta. This one was just as good, and nowhere near as bad for you. Next time I’m going to use use fresh ground turkey meat instead of COSTCO pucks. But wait! There’s more burgers in store. Click on the “Read the rest of this entry” link below for more. If you’re like the average American family, you’ve got a lot of leftover Turkey. There are the obvious ways of getting rid of it — Turkey Tetrazzini (fattening although this Tyler Florence version looks like it has some potential to be improved) Thanksgiving Sandwiches (Turkey with stuffing, cranberry sauce and gravy on a sandwich, delicious and also fattening). Turkey, in both ground and breast forms, has now become a staple in our household. It’s high in protein and relatively low in fat, and can be transformed for use in a number of adaptive dishes. We go through about a whole Turkey breast every week, because I’m now “brown bagging” it for lunch. 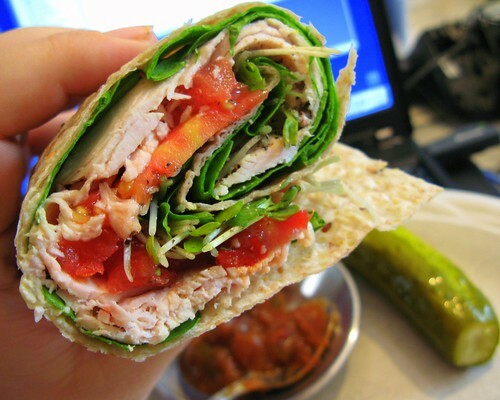 My typical lunch these days is the Monster Wrap, which ends up working out to only a few dollars per sandwich. If I had to buy the equivalent sandwich in downtown NYC, I’d probably have to pay 3 or 4 times that amount and I wouldn’t have as much control over the quality of ingredients I put into it. I like wraps because you can stuff them full of protein and vegetables, and it takes up relatively little real estate in my laptop bag. Unlike a regular sandwich, getting a little compressed or smushed in the bag doesn’t really affect the quality of the product once its time to eat it either. I don’t have to bring any containers with me — just wrap the sucker in aluminum foil, and I’m good to go. 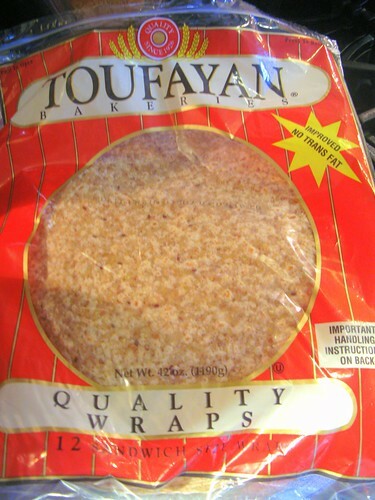 Toufayan is a NJ-based commercial bakery that supplies much of the wraps for use in delicatessen and catering applications. If you live in the Northern NJ area, you can actually go to the bakery and buy their goods fresh. They make a number of flavors, many of which you can get in your local supermarket. The larger ones they use for food-service size, however, might be difficult to get. In particular, I like the large multigrain wraps since they have more complex carbohydrates in them, so we get them straight from the factory. 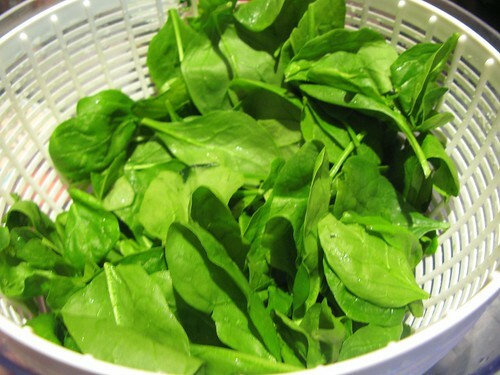 Fresh Spinach is a great vegetable to use in wraps. 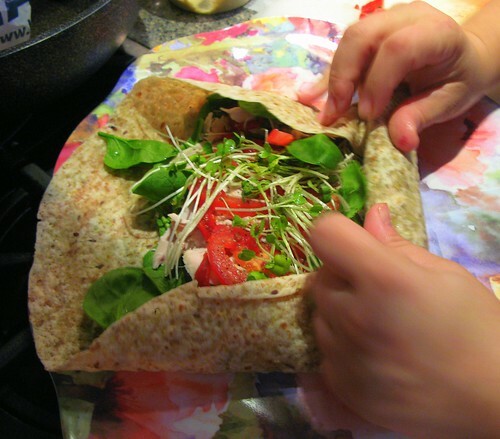 Unless you plan to eat a wrap immediately, you want to avoid high water content vegetables like lettuce because they’ll get your wrap wet and gummy if its going to sit in your bag or briefcase for a few hours. Arugula is a nice vegetable to use as well. Line wrap with mustard or your favorite spread, such as babaghanoush, ajvar, salsa, or hummus. 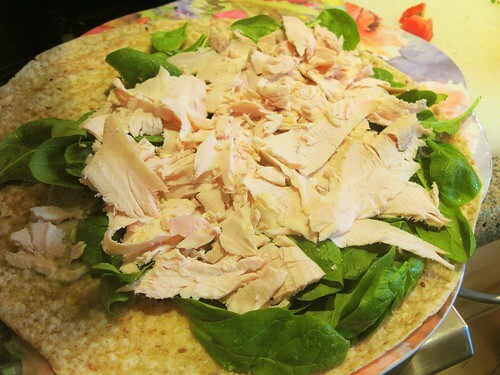 Place lots of turkey over the bed of spinach. Add tomatoes and sprouts, liberally season with salt and fresh cracked pepper.